This blog rightly deserves to be Part III of our Aleutian “road” trip, but it is in every respect a piece well suited to each Alaska autumn season and relates to so many of our journeys’ return legs. I recently felt compelled to give this season a stand-alone status. Please enjoy the color along the way. I have decided to include dates and basic settings on each of the photos. All photos were taken with a Nikon D800 and a variety of lenses. The observant reader will see my adage reflected in most of the photos, which is the rule to taking a good photo: f/8 and be there. In 2015 we start with our return from Homer, and our Aleutian road trip driving up through the Kenai Penninsula. 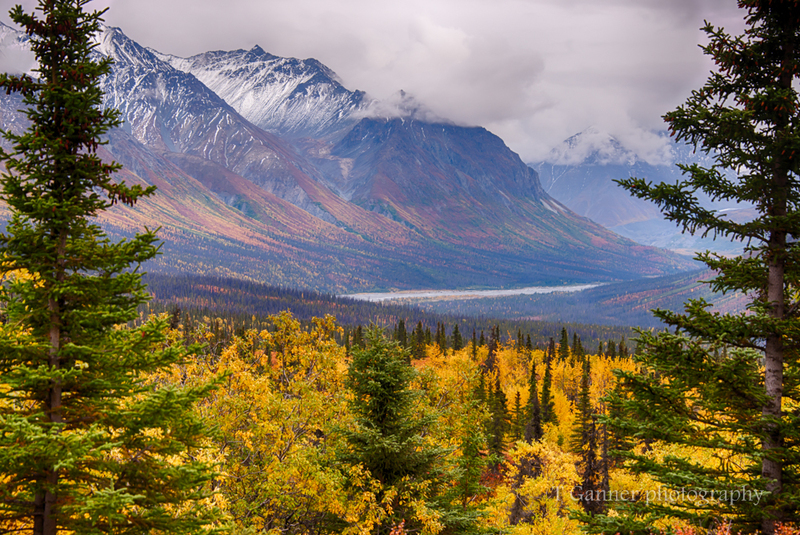 It is always hard to make progress, particularly this time of year when the Alaska autumn foliage is in peak season. I am a sucker for reflections, and this scene (among others) would not let me pass without pause for contemplation, composition, and appreciation. 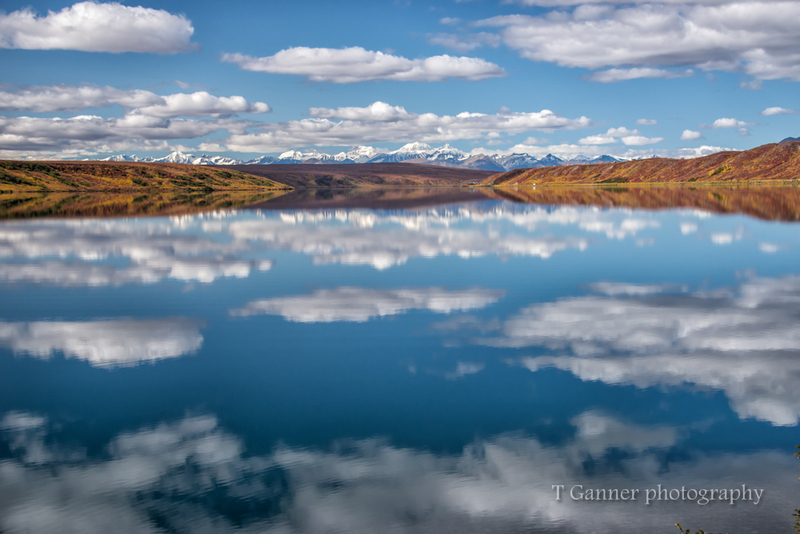 Along the Glenn Highway, Long lake never fails to call for a pull out and pause. 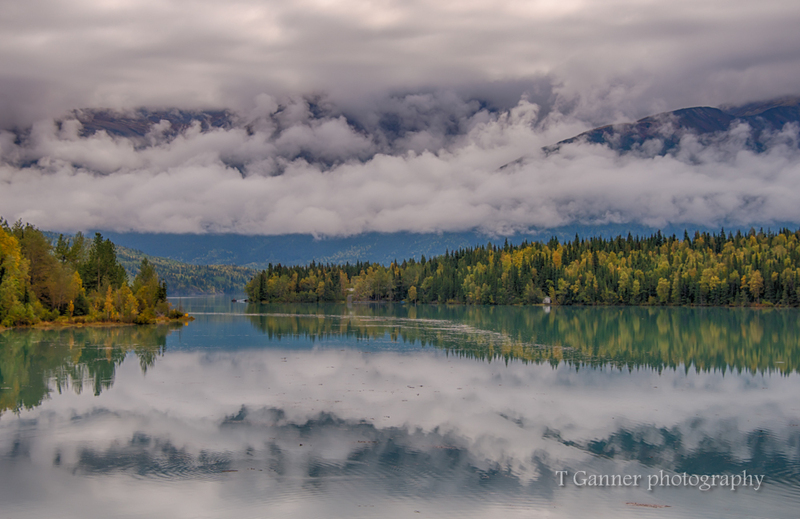 I was very happy to find a moment of quiet reflection and color last year on our way home from Anchorage after a run into Denali. 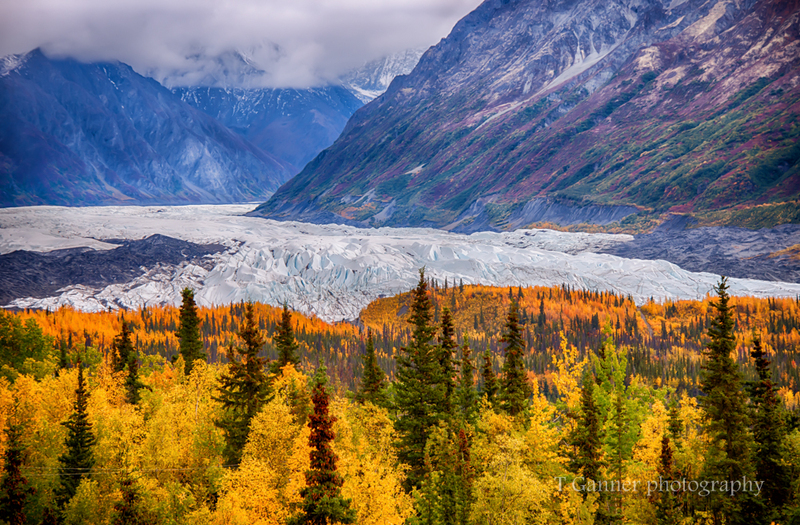 We had stopped at this location overlooking the Matanuska Glacier on our way to Homer a few weeks earlier, and I got what I thought was a wonderful shot, but by the time we returned on this day, the aspen and tundra foliage had really hit their peak and epitomized the Alaska autumn season. We are due to spend the night at the Gakona Lodge (a few hours up the road) and hoped to make it there in time to take advantage of their restaurant, but the opportunity to immerse ourselves in another age and another reality are too good to pass up. I always like to remember the words of Lao Tse: “The good traveler has no fixed plans and is not intent on arriving.” There is no way we can sacrifice the present. 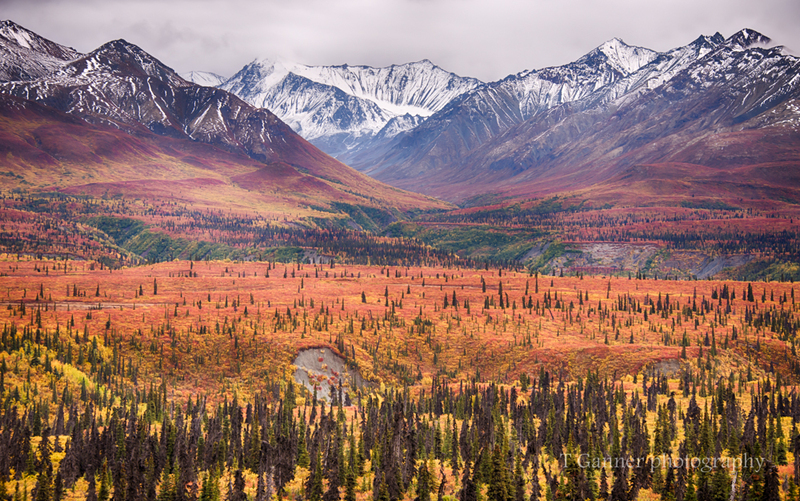 Looking down the valley, the classic U-shaped valley glacial morphology from another era of Earth history, and so graced by autumn splendor. On our way to Gakona Lodge, I wondered if we were ever going to make it as the scenery kept compelling me to pull over marvel at nature’s pallet. We actually made it for dinner, despite my best efforts at delaying our arrival. I could not help myself when I came upon this amazing collage of color. In working with the composition, I again came to the conclusion that “less is more” and Robert Capa’s admonishment that is your picture isn’t good enough it is because you are not close enough. Power of the zoom. I include both shots to make my case. While I did HDR processing on these photos, I did not bump up the saturation. This is pretty much how it looked! We rise the next day to engage in a side excursion. 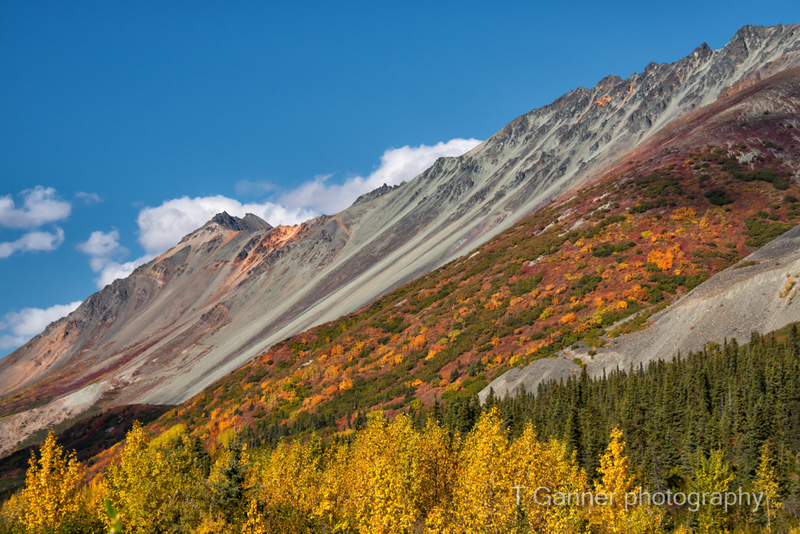 Leaving the Glenn Highway, we travel briefly up the Richardson Highway to Paxson, where we will indulge in the Alaska autumn foliage and make a run down the Denali Highway. 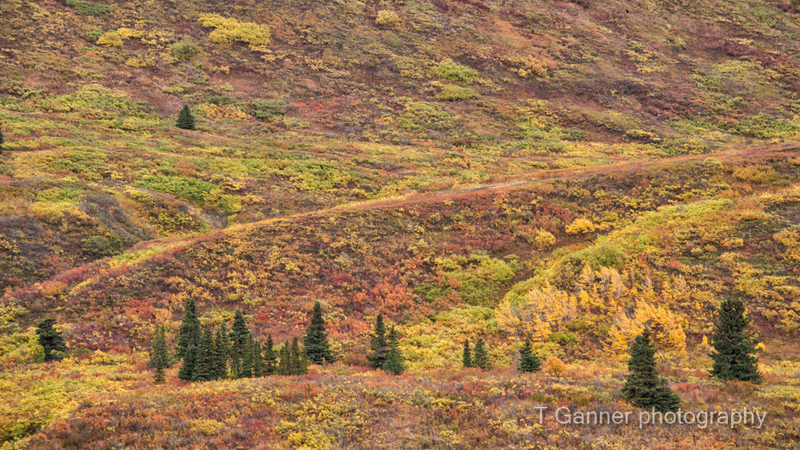 I have driven the Denali Highway a few times, and have found it to be one of the prettiest roads in America. 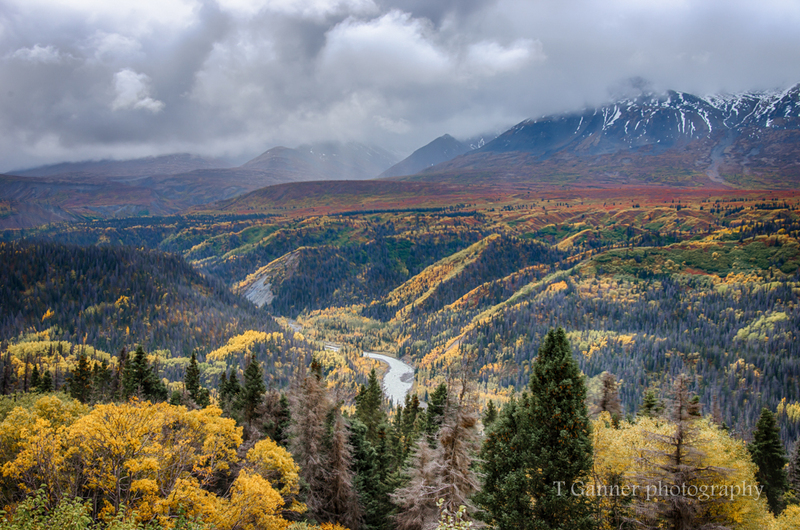 Opened in 1957, it was the first road access to Denali National Park. Look closely and you will see the road follows along the top of a ridge. This road is built upon a relic glacial esker. 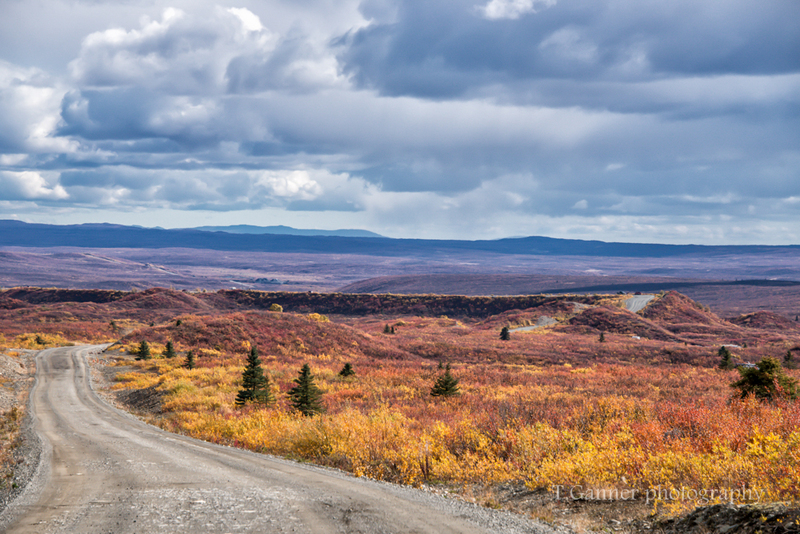 The Denali Highway is a gravel road that stretches 135 miles between Paxson and Cantwell. 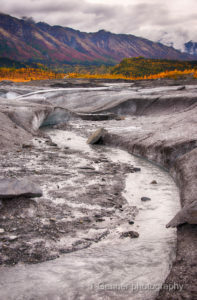 Many parts of the Denali Highway travel along Eskers or ridges of gravel formed by streams flowing under glaciers. 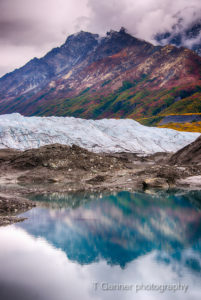 As much of the area was covered by glaciers thousands of years ago, the builders of this road used a natural feature to construct the road rather than cutting across lower lands filled with water and tundra. This particular esker also allows the visitor to view many Kames, conical hills or terraces, and Kettle Lakes, holes formed by melting blocks of glacial ice. 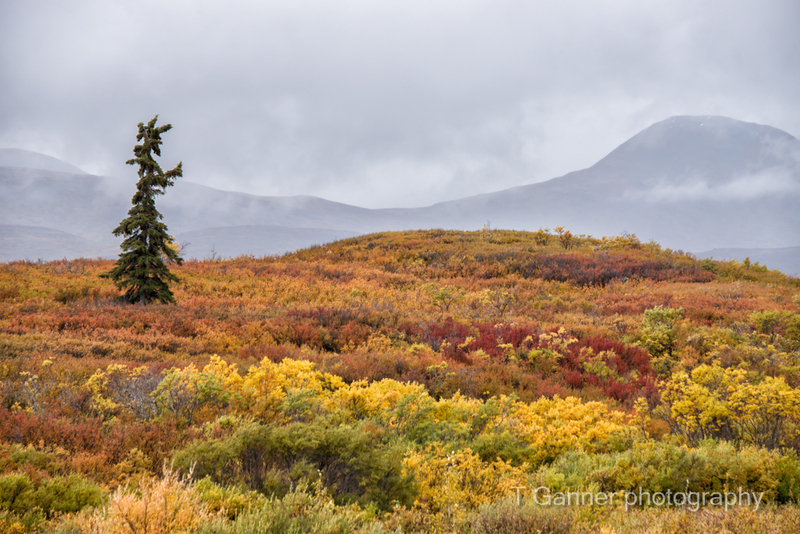 We actually just missed the peak Alaska autumn foliage season on the Denali Highway, but there was enough remaining to make the trip very worthwhile. It was the beginning of hunting season, and caribou hunters were out in force on ATVs. Everyone had binoculars out and were scanning for some game, no one we saw was getting much beyond searching for some sign. We were happy for the caribou and wished them well for their future. 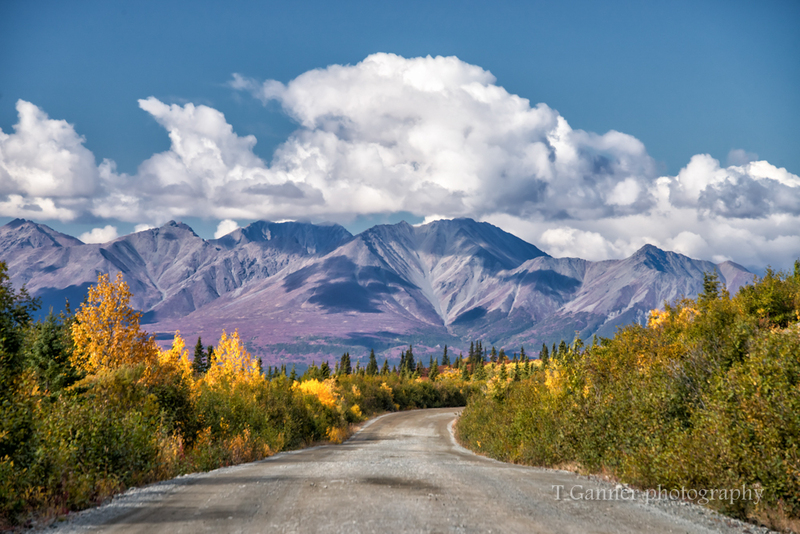 Returning back to the Richardson Highway, it is time to head for home. 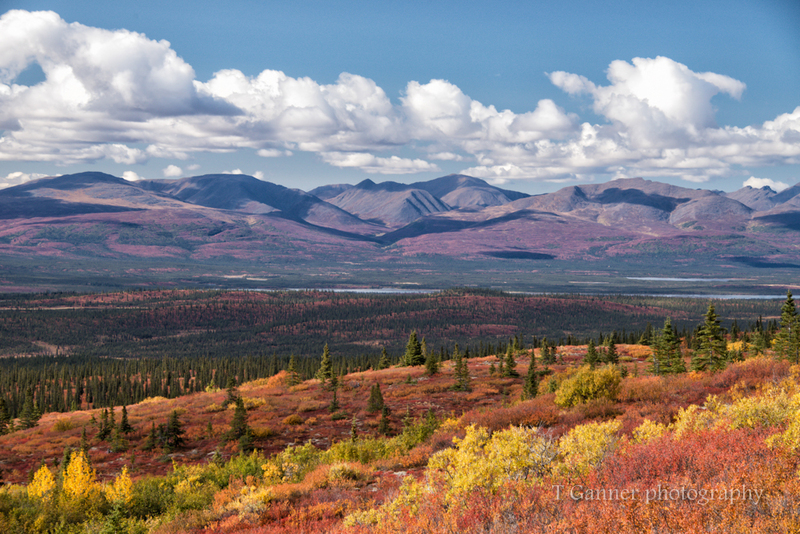 Given the little side trip down the Denali Highway, it will take us the better part of two days to return to Haines. I always have to factor in the pull-over time I spend, being a sucker for sumptuous scenes and reflective moments. It is always a two day journey to get home the Gakona/Glennallen area. Big country and plenty to see along the way. We tend to stay in either Tok or Beaver Creek (Yukon) for the night to break up the trip, though the last few trips I have favored Tok. As often as not, I do not mind making the return trip a three-day journey if we have an opportunity to overnight in Haines Junction (Yukon). 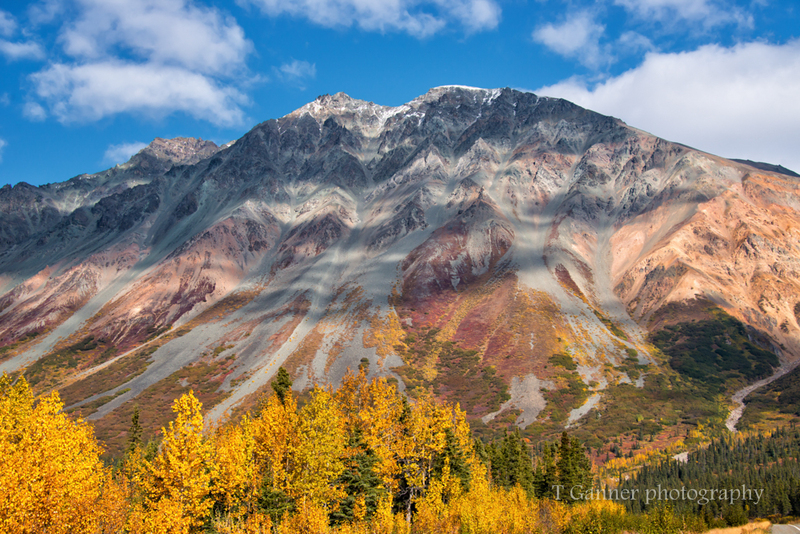 Kluane National Park never fails to amaze, inspire, and often stop me dead in my tracks. 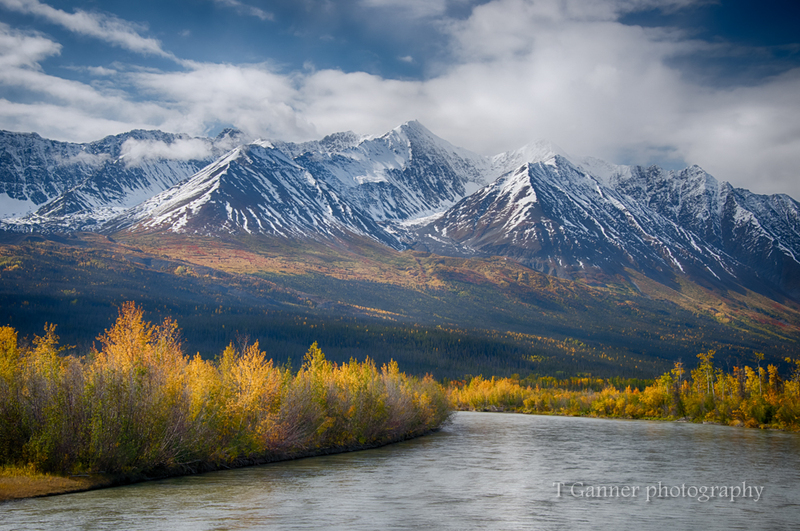 Why should we be in any hurry, in a country as eternal as Kluane offers. 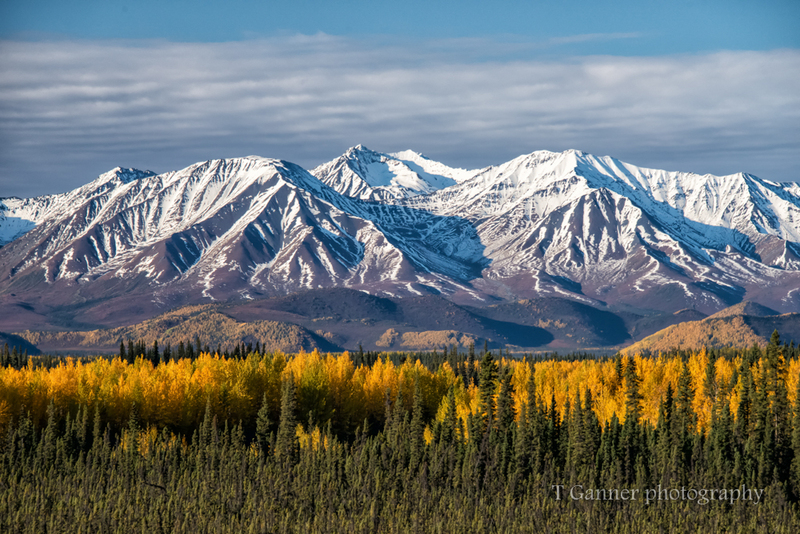 I think I am talking myself into giving Kluane a full measure on the blogosphere here sooner than later. Meanwhile, enjoy a few shots that I made along the way. Early morning just outside Beaver Creek, YT, coming into Kluane country. Great light, and the parfait layers of eye candy really drew me. Greens to yellows to snowcapped peaks and heaven above with a touch of blue sky. So many layers! 9/7/2015 ISO 400, 180 mm, f/8, 1/500 sec. 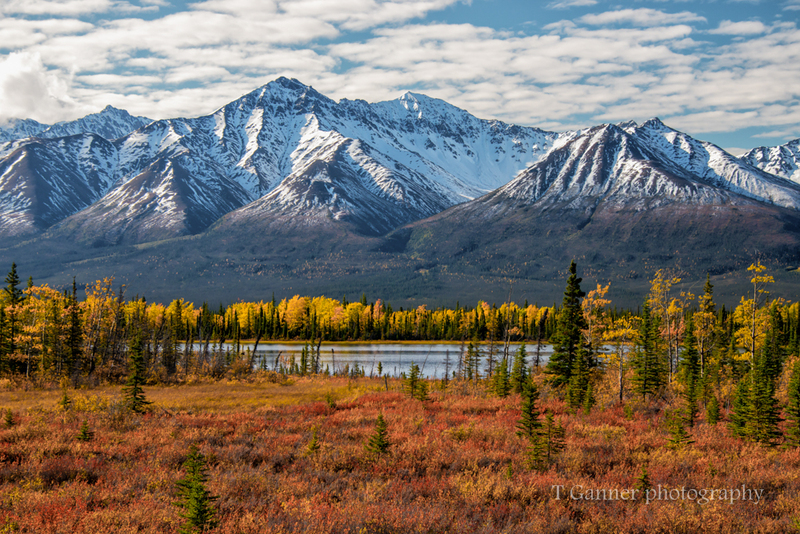 Another early morning shot of Kluane country making our slow way along the Alaskan Highway. Layers and colors have me licking my chops. It is God’s country, though God is getting ready to hibernated in a den. 9/7/2015, ISO 400, 85 mm, f/8, 1/400 sec. 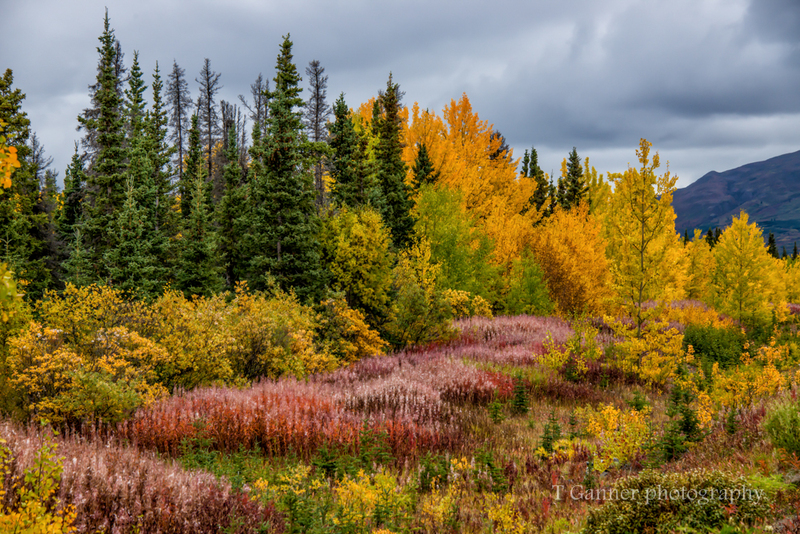 The Haines Highway is awash in color between the spruce, aspen, and fireweed. Fireweed is a gift that keeps on giving, from its pink floral displays throughout the summer, to its variegated reds in the autumn season after it has gone to seed. Finding the perfect spot to capture the compliments makes for a lot of stops along the way, and I think I got what I was after on this occasion. I think a good photo requires a strong subject, and sometimes that subject is just color. 9/7/2015, ISO 400, 135 mm, f/8, 1/640 sec. 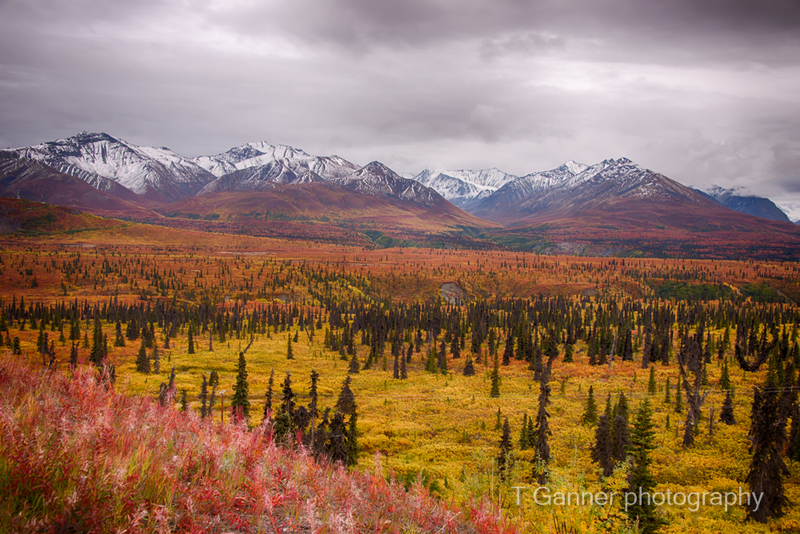 The sub-arctic tundra of the Haines Pass is beyond spectacular during its quick seasonal display. “Autumn wins you best this its mute appeal to sympathy for its decay.” -Robert Browning. 9/7/2015, ISO 400, 160mm, f/8, 1/200 sec. 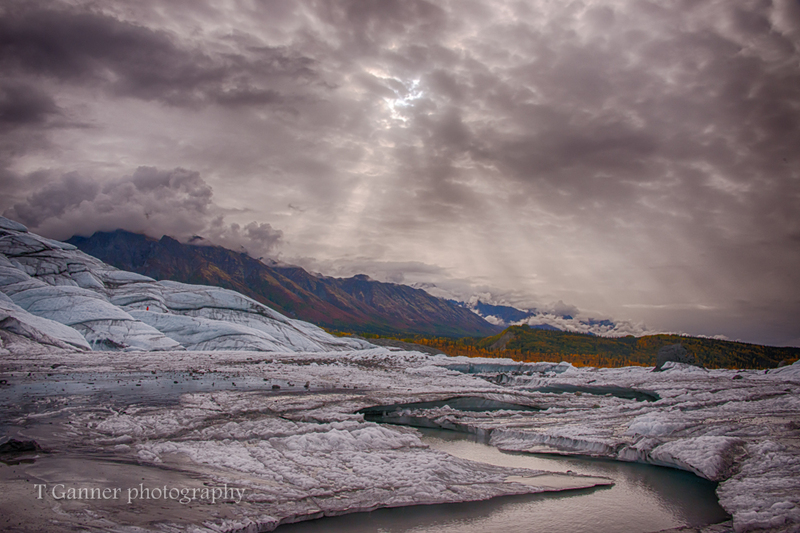 Haines Pass; sub-arctic tundra. “No spring nor summer beauty hath such grace as I have seen in one autumnal face.” -John Dunne. 9/7/2015, ISO 400, 180 mm, f/8, 1/500 sec. It took a while, what with stops at every turn, but we finally made it home to Haines. Upon entering the house, and lifting the shades to look out over the wonder of the Chilkat Range, I was once again grateful to live in a place that we are always happy to land at the end of a long lovely trip. 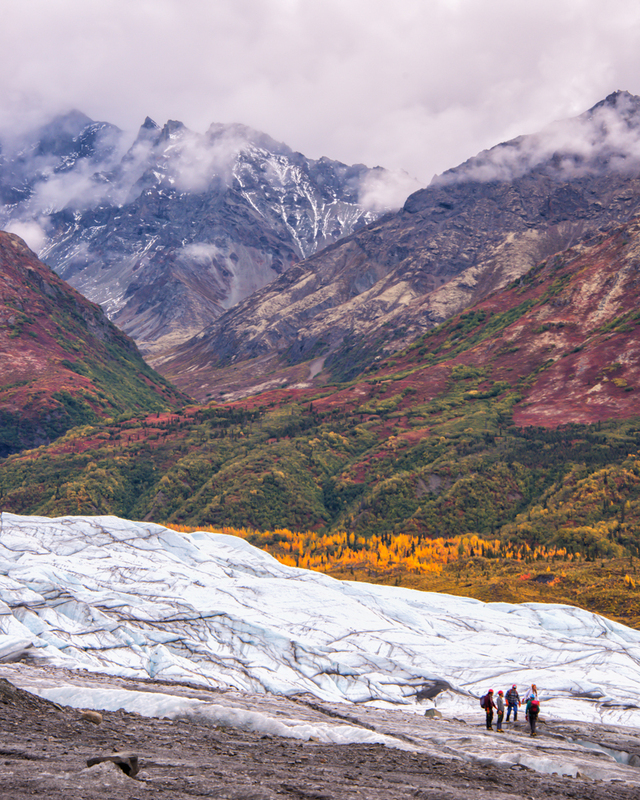 Another great perk … Alaska autumn is still weeks away in Haines, and we will have the joyful experience all over again. 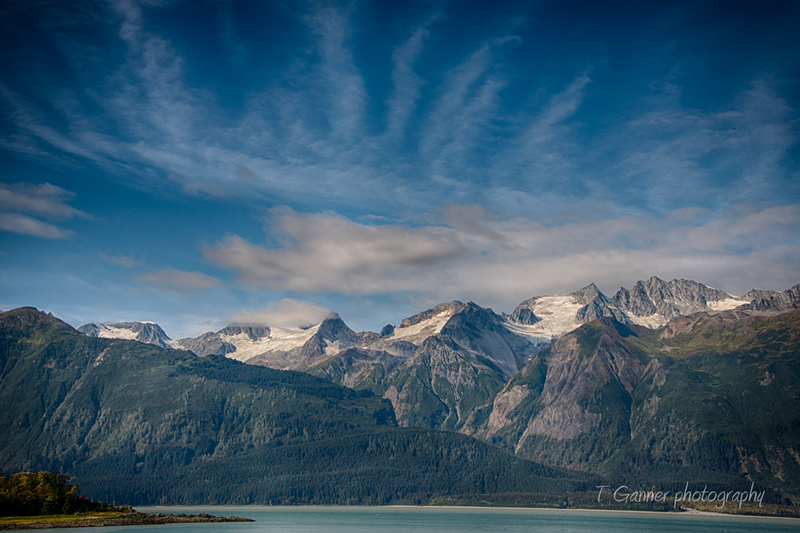 Chilkat Range, Haines, Alaska. 9/8/2014; ISO 800, 55 mm, f/20, bracketed series. 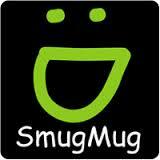 Trying a different browser Tom. 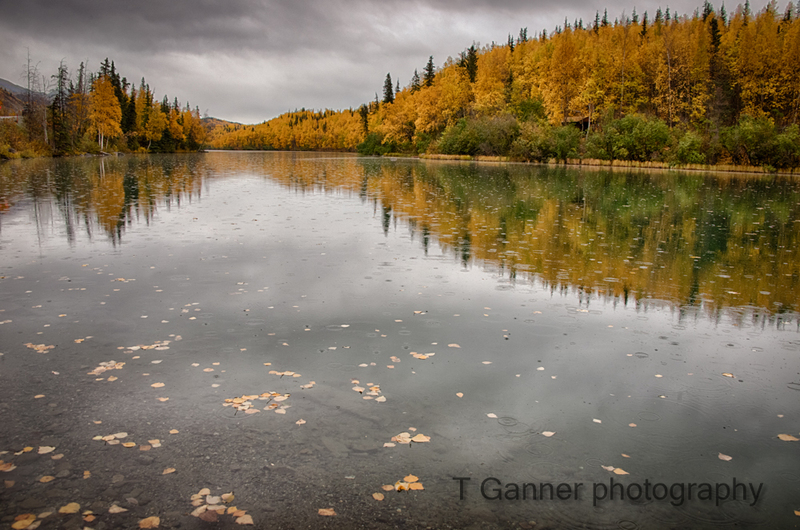 As in the past, enjoyed your words & pictures Along the Alaska autumn trail. Looking forward to your next travelog. What a beautiful journey! It’s the next best thing to being there! Thanks so much for sharing “God’s Country” with us!